With fifteen teams signed for the 34th America’s Cup, the question persists, How many will actually show up on San Francisco Bay with a 72-foot catamaran in 2013? Most of them, and that’s as far as I’m taking my guesswork. A two-week period of testing begins next Tuesday, with the teams collaborating to try out course configurations and the like. Later, with a sixth AC45 catamaran completed to join the game, there will be a test of the new electronic sports graphics developed under the lead of Rolex Yachtsman of the Year Stan Honeythe sports graphics that are aimed at revolutionizing sailing broadcasts while moving the umpires into a booth ashore. And in the realm of Very Good News, today the ever-reliable Team New Zealand reinforced the outlook by confirming that they are not merely entered, not merely in a holding pattern, but in with both feet. The team put out the following release. Guillaume Chesneau, New Zealand Country Manager for Nespresso, announces Nespresso sponsorship for Emirates Team New Zealand. “Racing in catamarans will make the 34th America’s Cup very different than the 32nd at Valencia in 2007. In 2013, teams will be racing 72ft catamarans. Design, engineering, logistics, and sailing skills are very different. “To handle this new challenge we have assembled a very accomplished group of people both on and off the water. 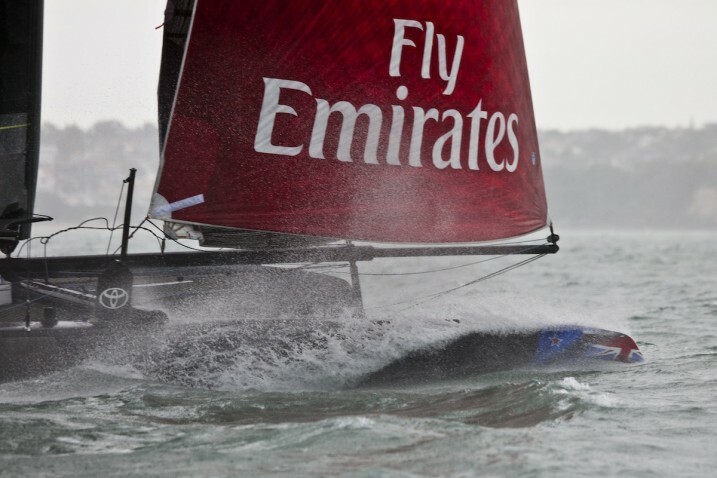 The Emirates Team New Zealand design team now numbers more than 30 designers, engineers and people who bring specialist multihull knowledge and skills. They have been working on the 72ft catamaran for some months and we believe we are right on the pace. “Our sailing team is working to acquire the skills and experience necessary to compete well. Six months ago Dean Barker raced in a multihull regatta for the first time. Last weekend he, James Dagg, Jeremy Lomas and Glenn Ashby were second in an Extreme Sailing Series regatta in China. Results in the A Class catamaran regattas in Australia earlier this year were remarkable,” Dalton said. “Today, we announce with confidence that we will compete in the 2013 America’s Cup. We thank our loyal sponsors, our partners and our suppliers for backing the team since Valencia in 2007. Emirates Airline, our naming sponsor since 2004, Toyota New Zealand, a sponsor for 20 years, Omega, the prestigious Swiss watchmaker, a sponsor since 1995 and the New Zealand Government. Dalton said: “Today we welcome Nespresso, a premium Swiss-based international coffee brand, as a team sponsor for the 34th America’s Cup. Nespresso is well-known in sailing circles, a long-time supporter of the sport. Emirates Team New Zealand values its association with premium international brands like Nespresso, where continuous innovation and commitment to success are a core part of the culture.